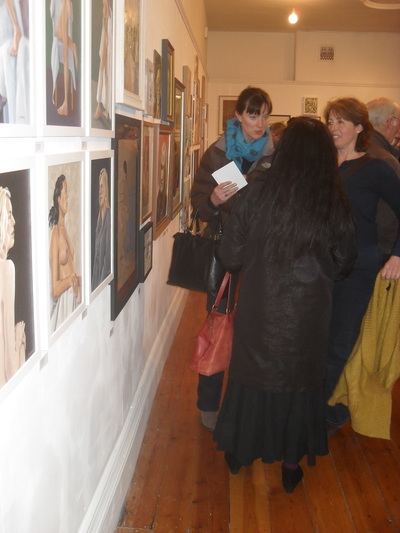 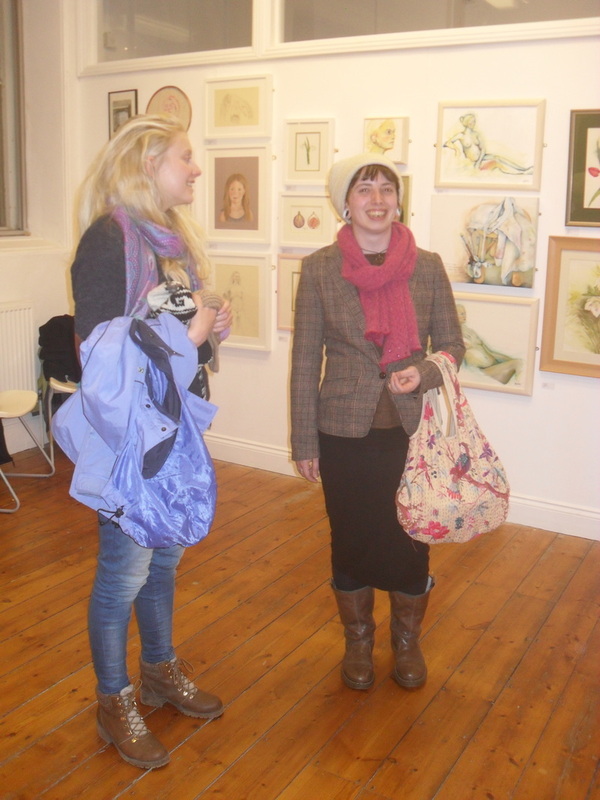 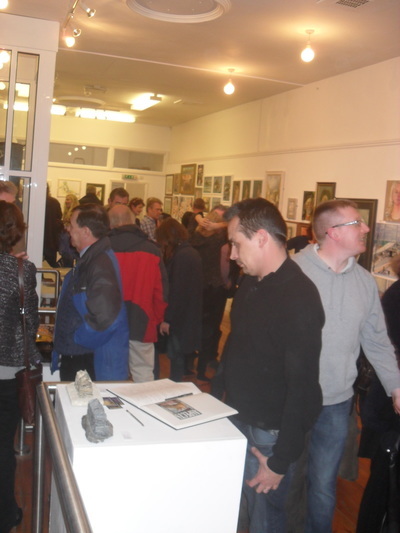 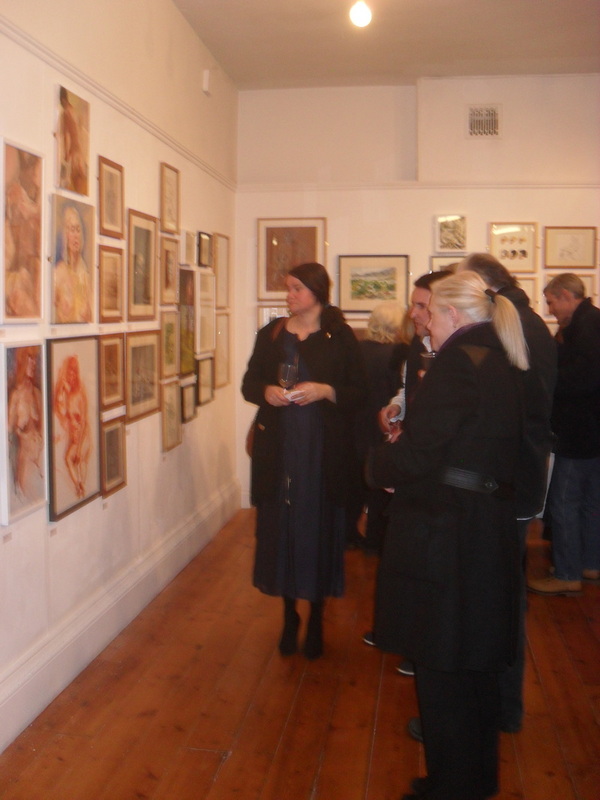 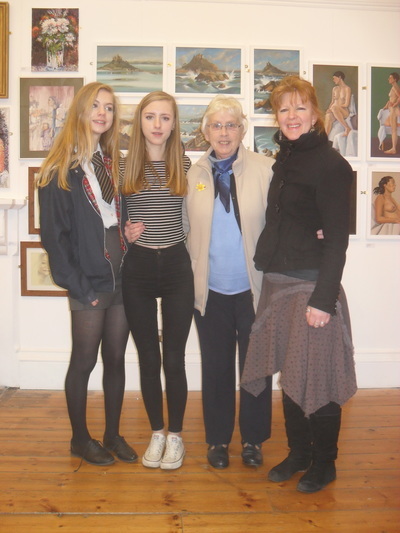 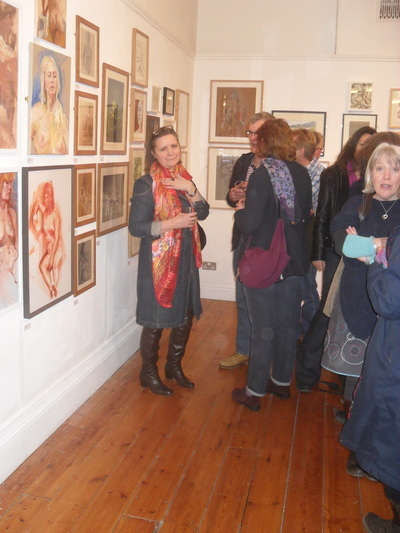 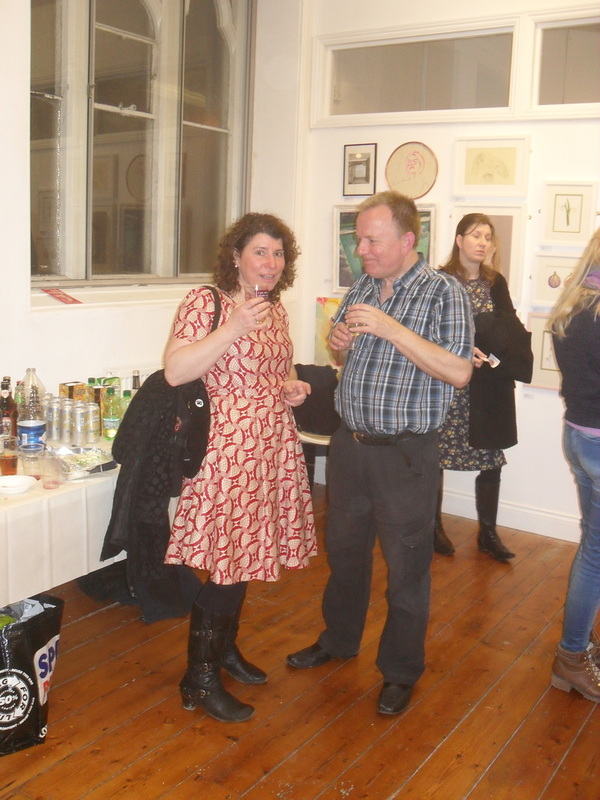 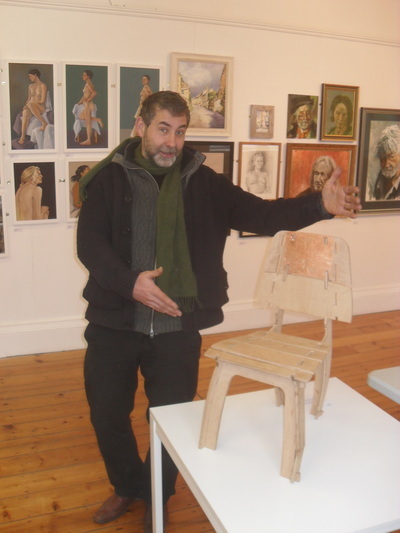 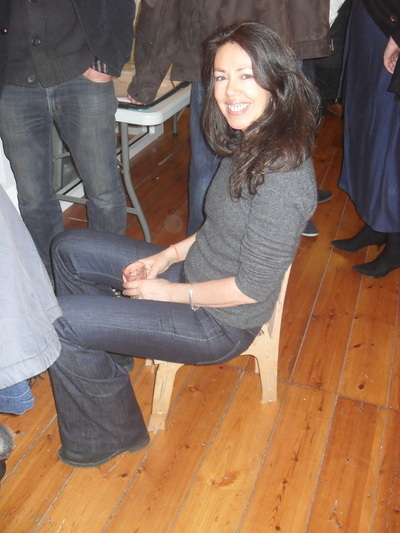 ‘Aspects’ was the fourth Stroud Life Drawing exhibition and it was certainly the most interesting and varied so far. 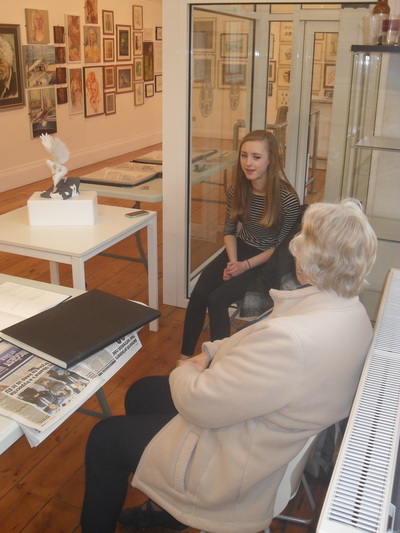 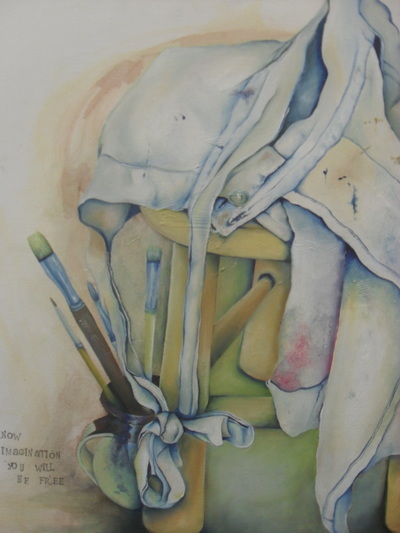 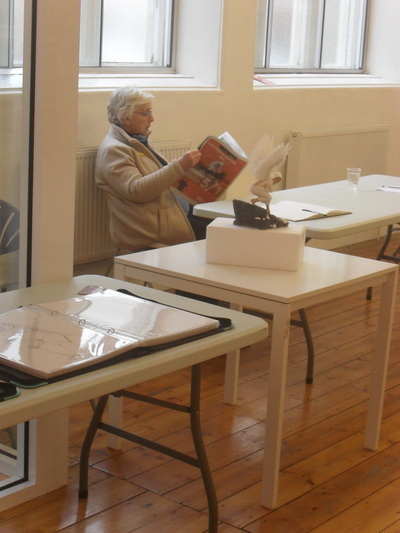 In addition to life drawings and figure studies, artists were invited to show other aspects of their work, which made for a fascinating mix of subjects and approaches in a wide range of 2D and 3D media. 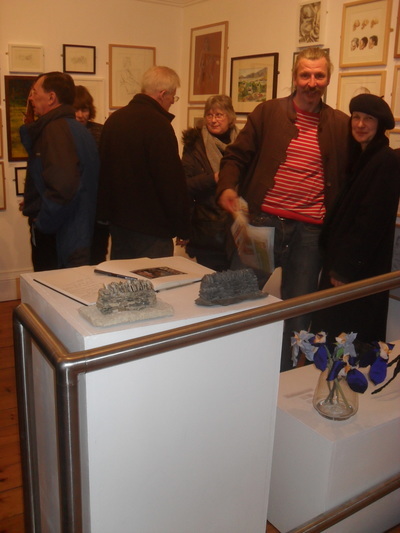 With Quin’s ingeniously designed chair, Alice’s beautifully made textile irises, Mick’s animal sculptures and Lee’s quirky stone walls, the 3D work drew more attention than ever before. 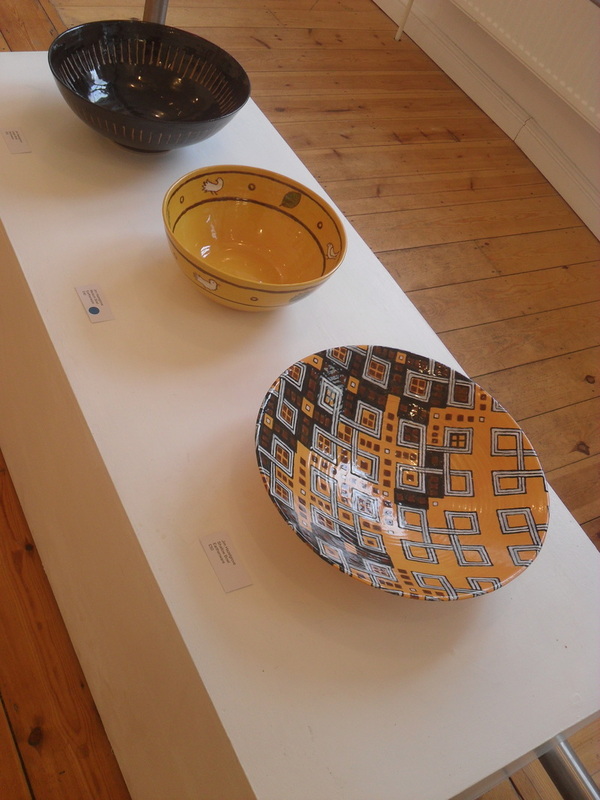 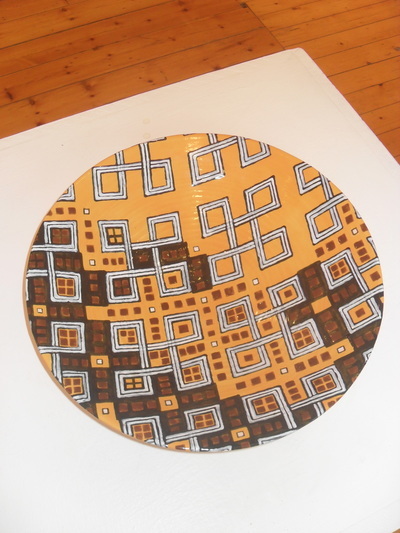 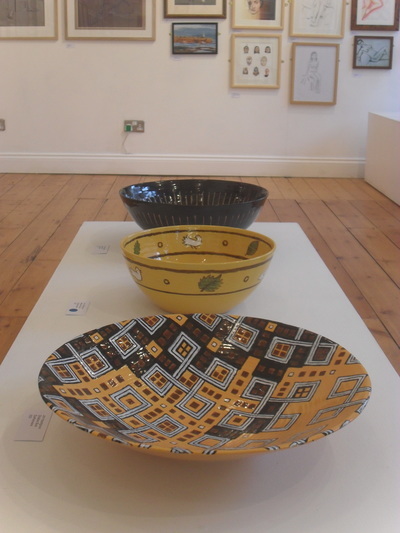 Indeed, Jim’s fine salad bowls were widely recognised as the quality studio ceramics which they undoubtedly are, two of which were quickly snapped up by discerning collectors. 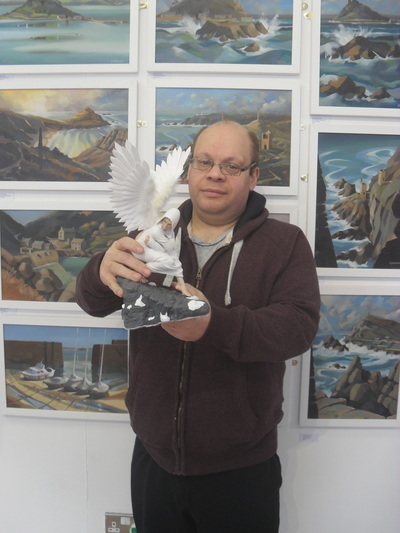 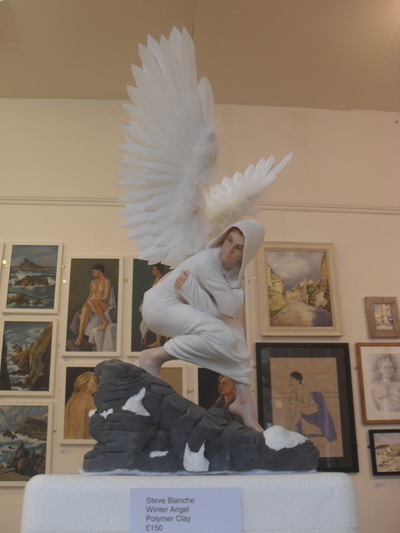 Perhaps unsurprisingly, ‘Winter Angel’, another of Steve’s breathtakingly well modelled figurines, also went to a good home. 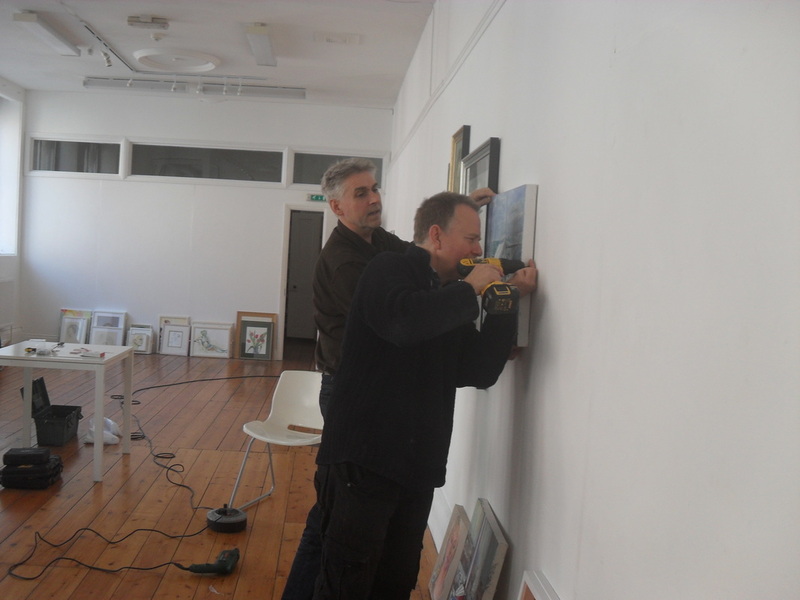 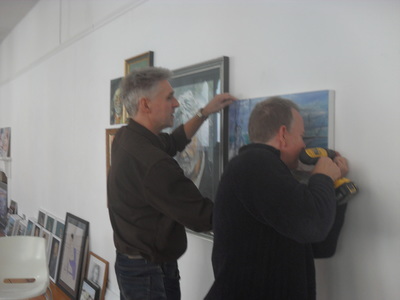 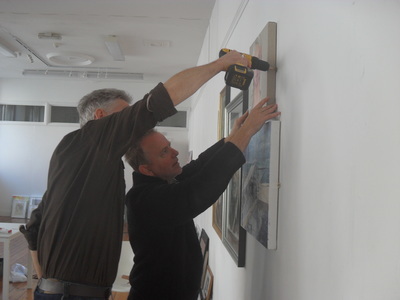 Yet again, Chris helped me hang the work and take it down at the end of the week. His local landscapes, flowers and mother and baby pictures were much admired and added greatly to the variety this time around. 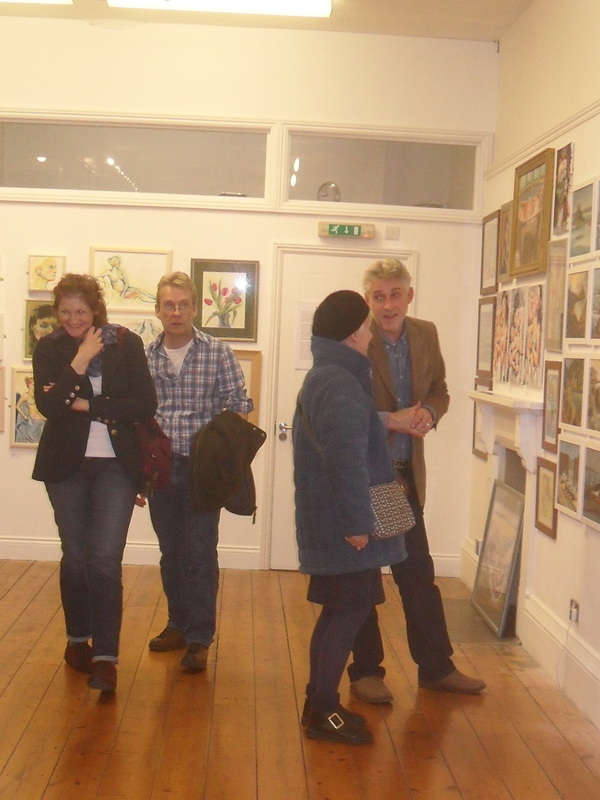 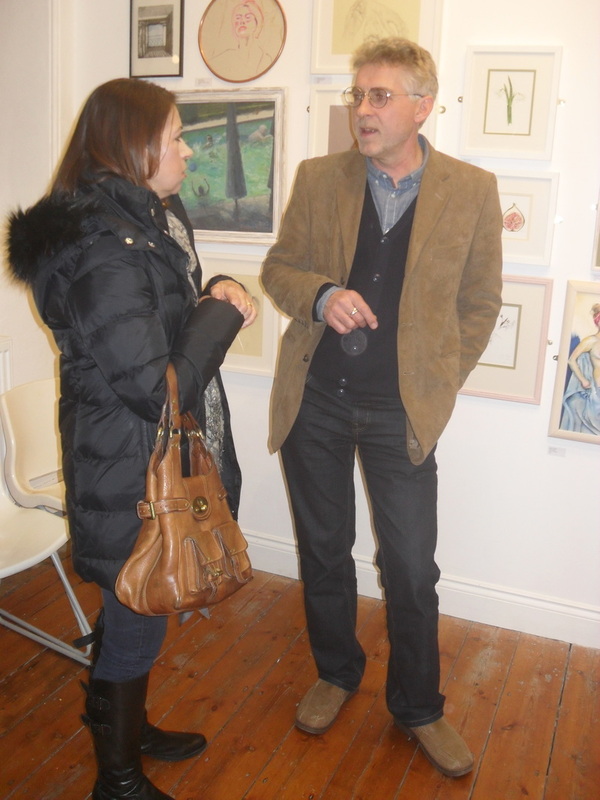 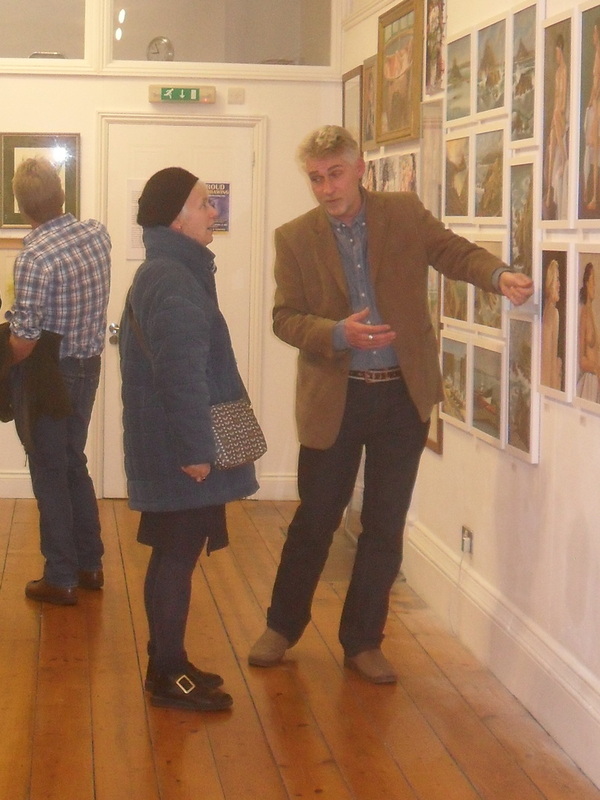 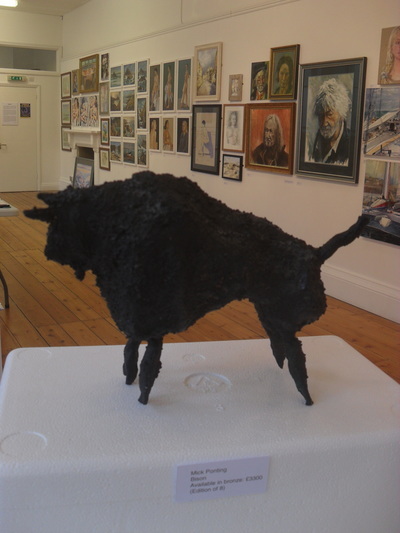 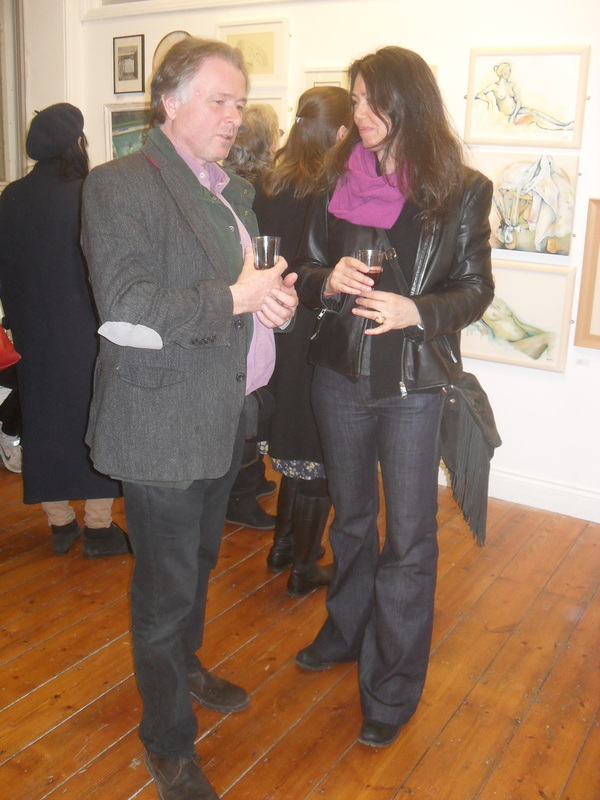 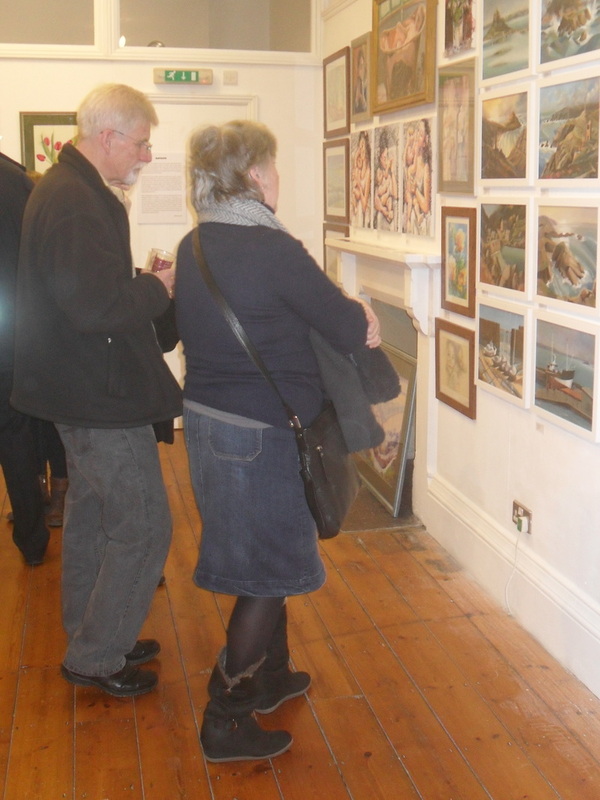 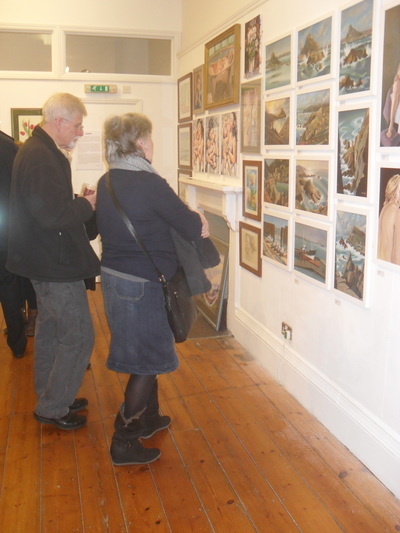 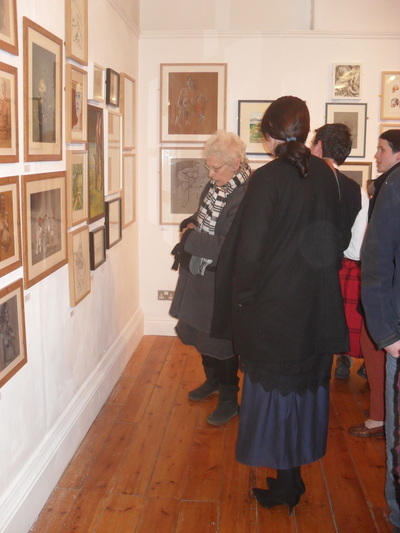 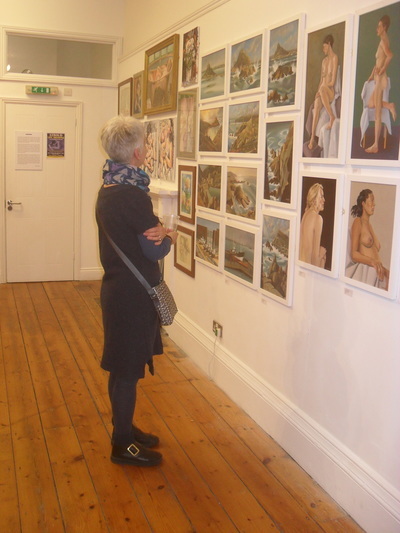 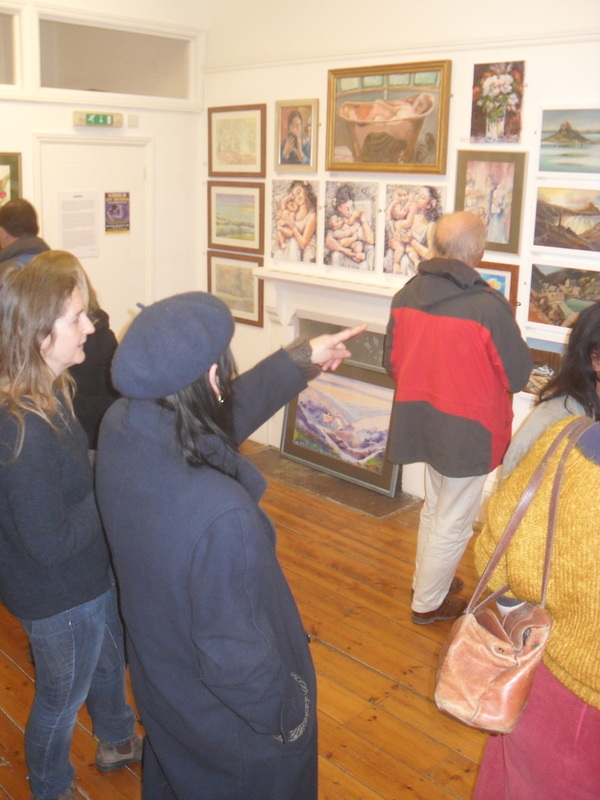 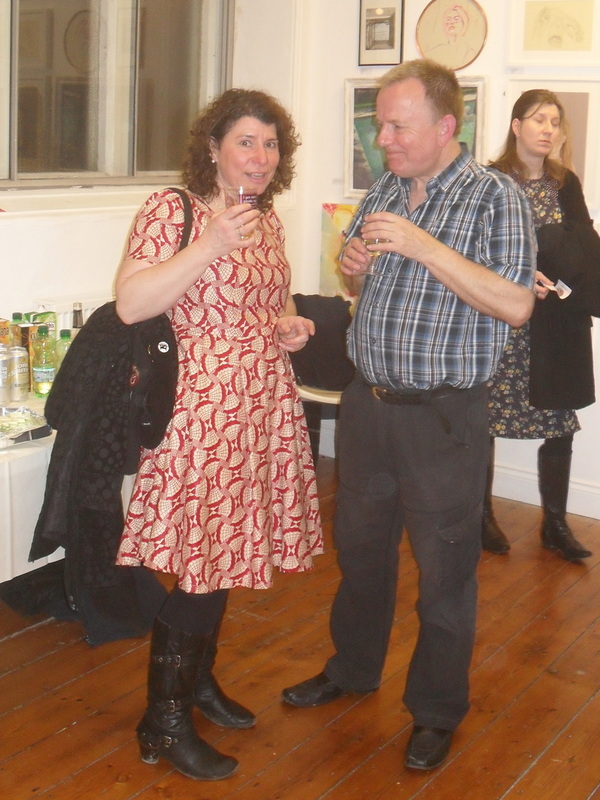 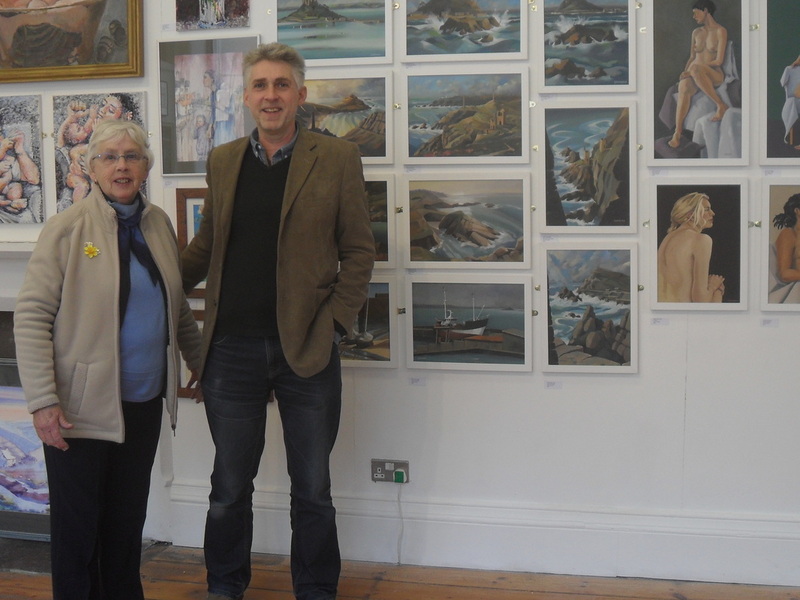 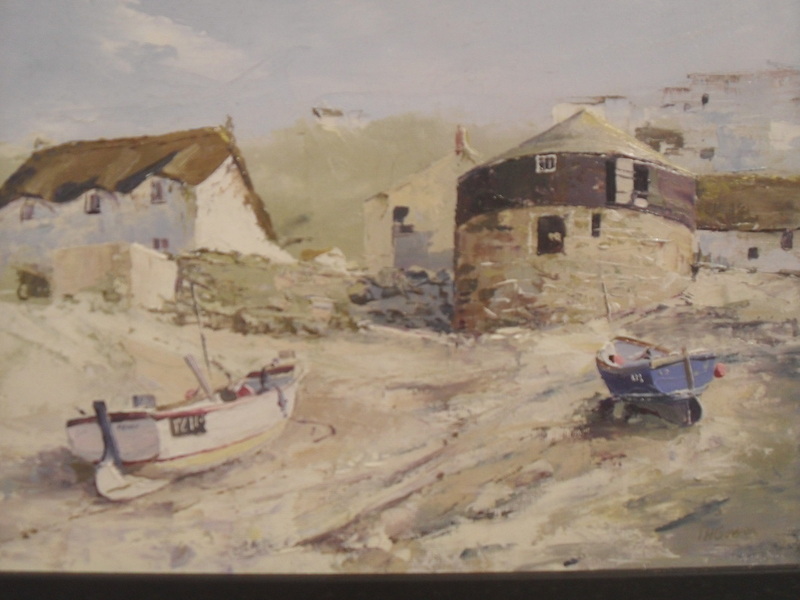 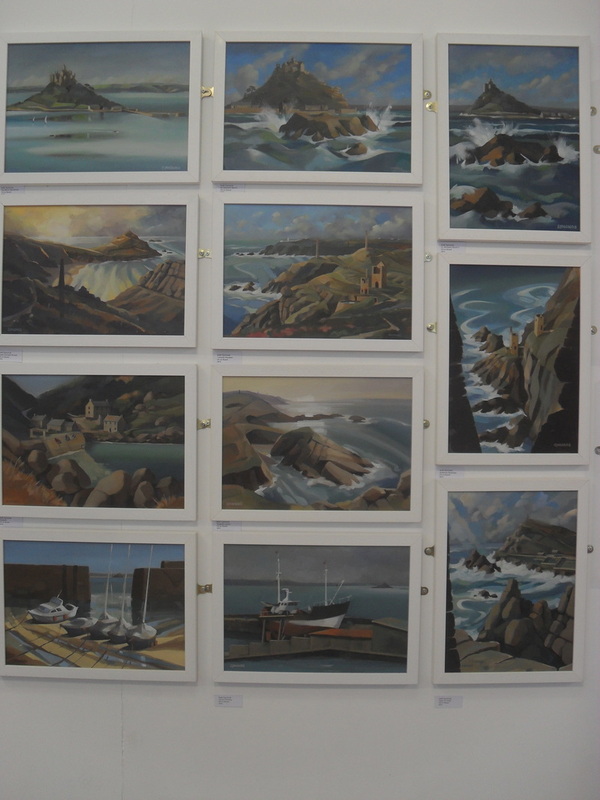 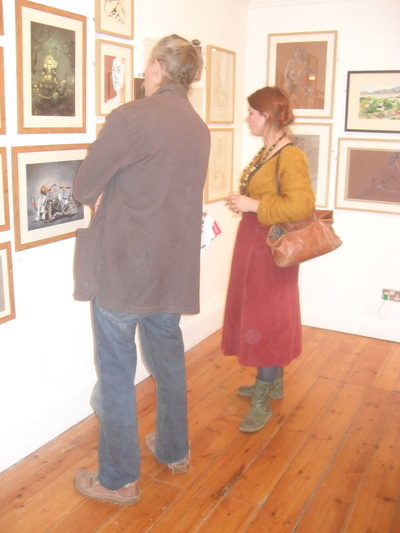 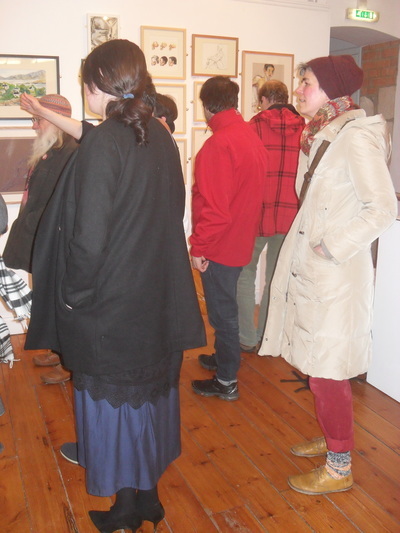 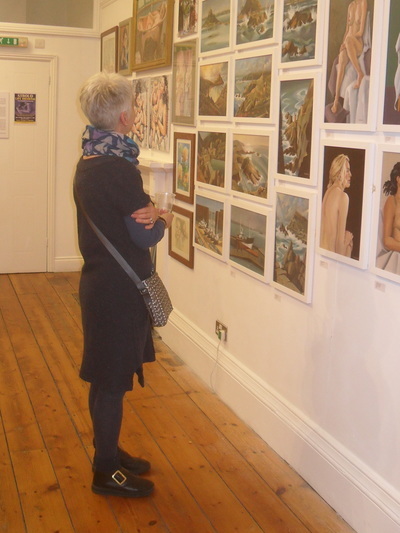 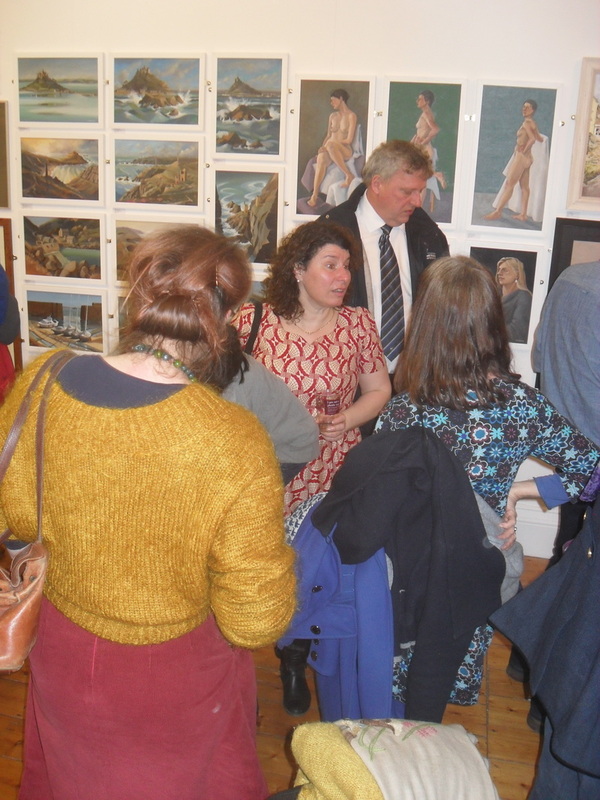 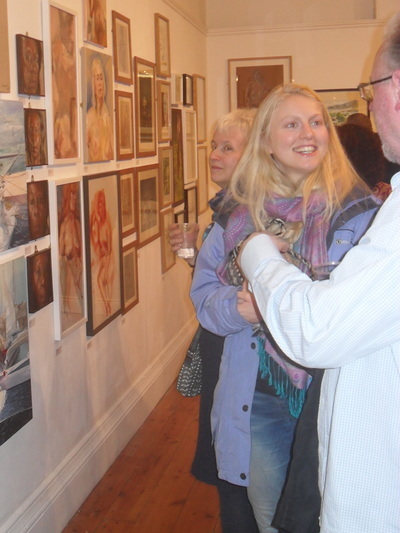 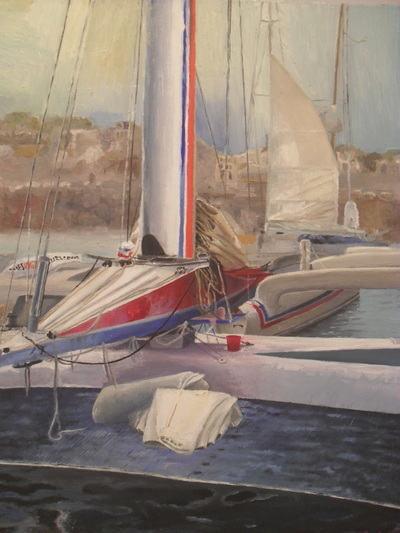 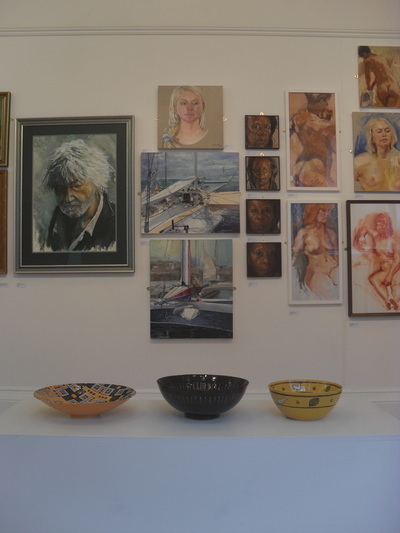 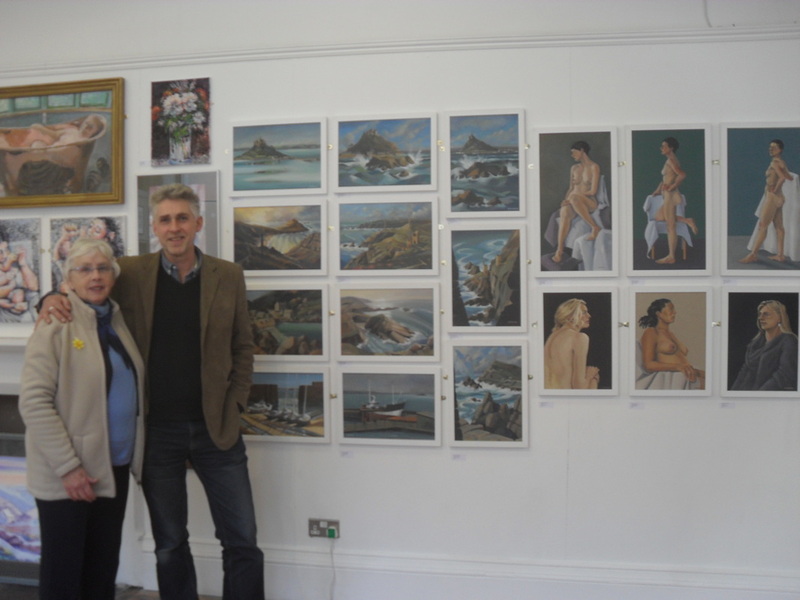 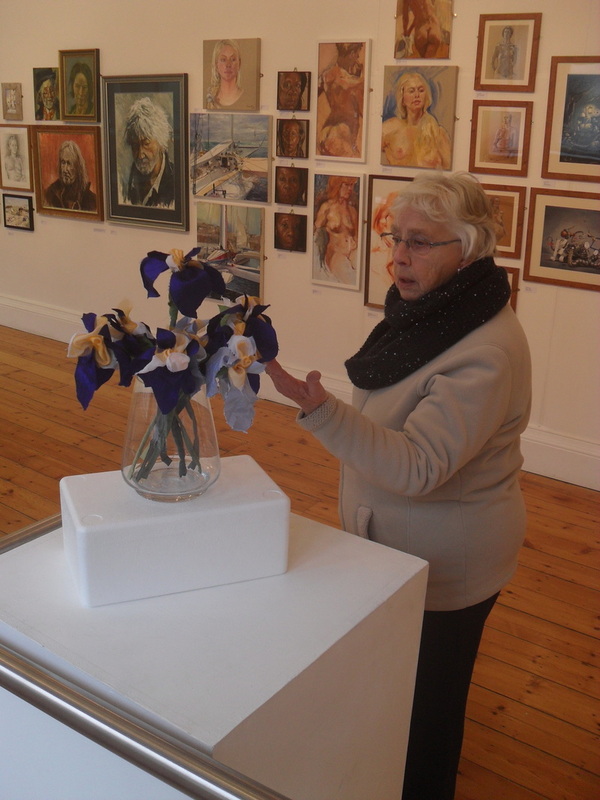 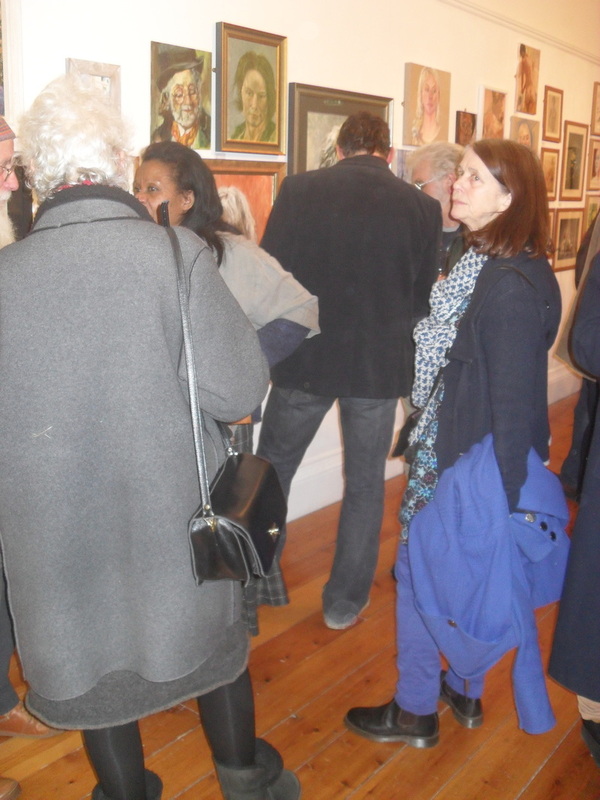 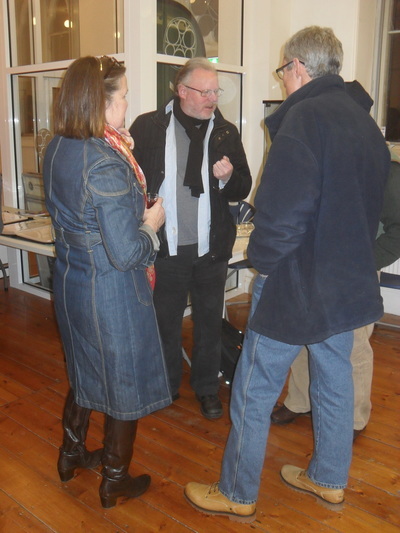 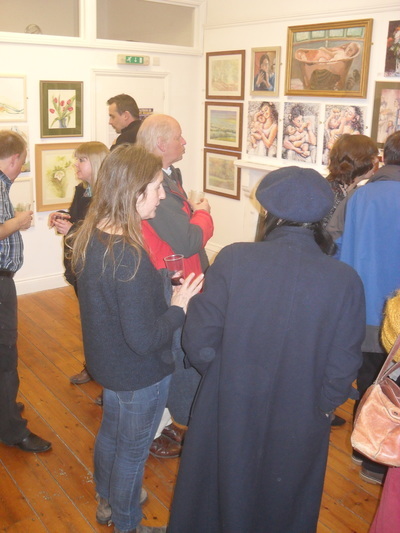 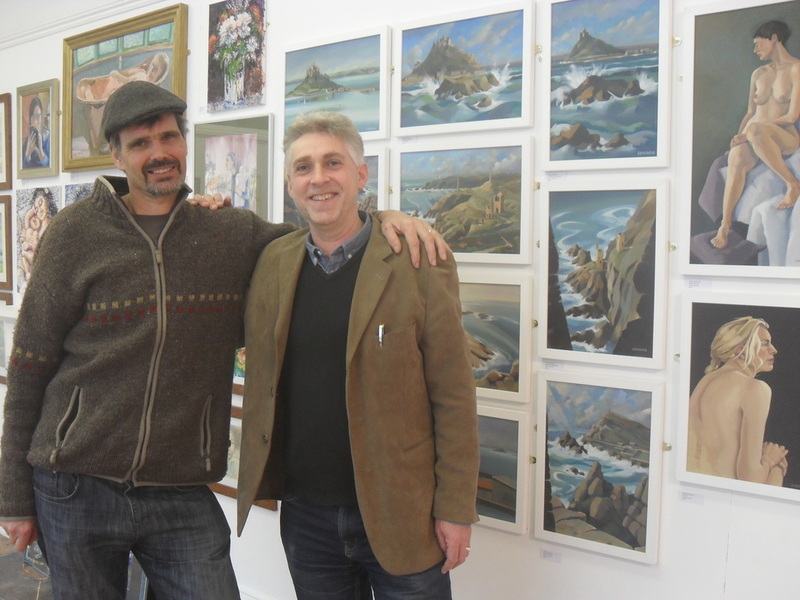 With Karen’s finely observed botanical studies, Liz’s flowers, my Cornish seascapes, Tom’s painterly landscapes, Corinne’s impressive boats, Jane’s amazing horse and Emma’s skilful gouache illustrations, there was much to hold the viewer’s attention. 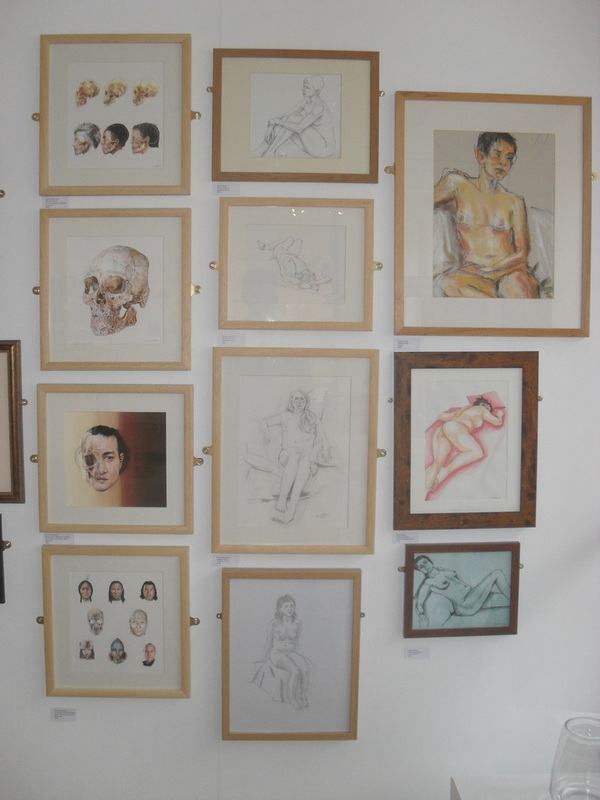 It was noticeable how many of the people coming in spent a long time carefully looking at the pictures and really wanted to discuss the work of individuals, as well as that of the life drawing group more generally. 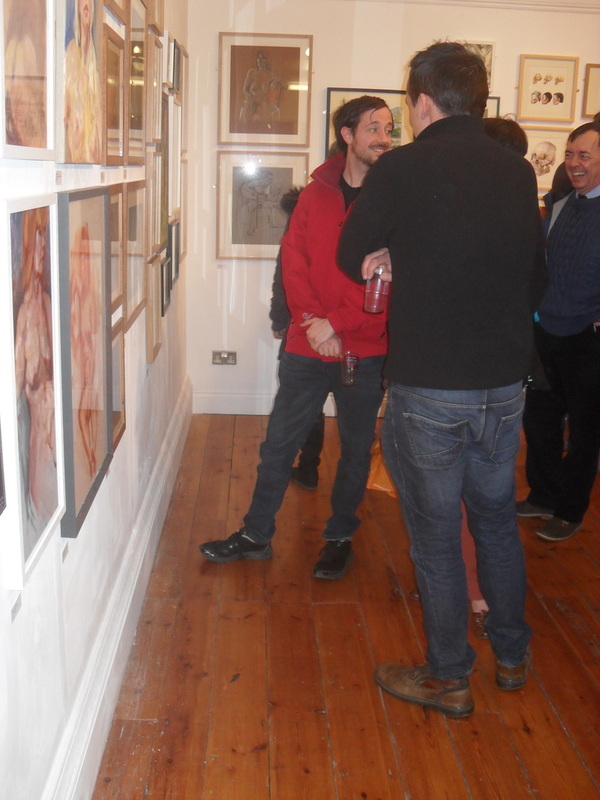 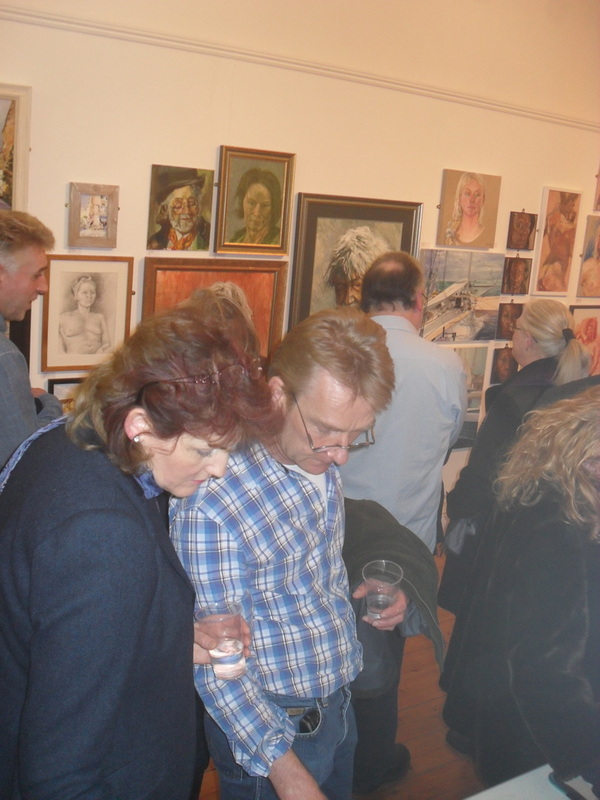 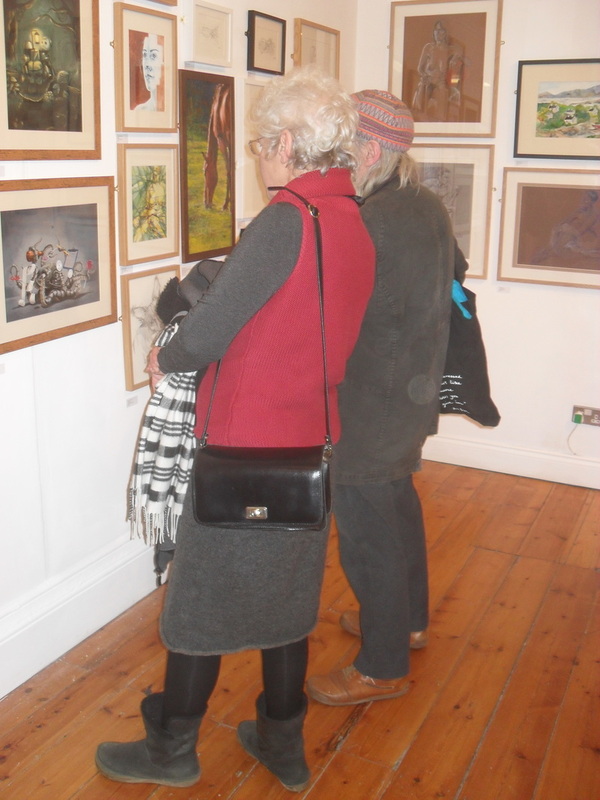 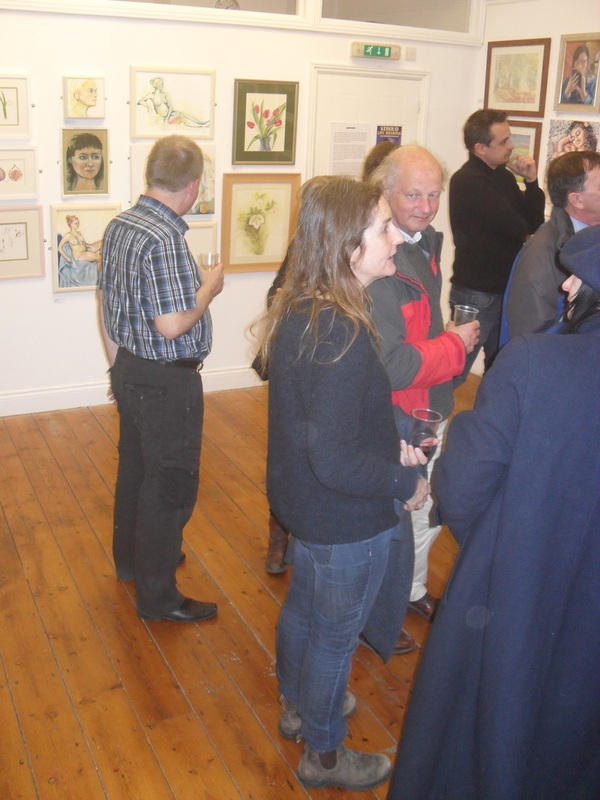 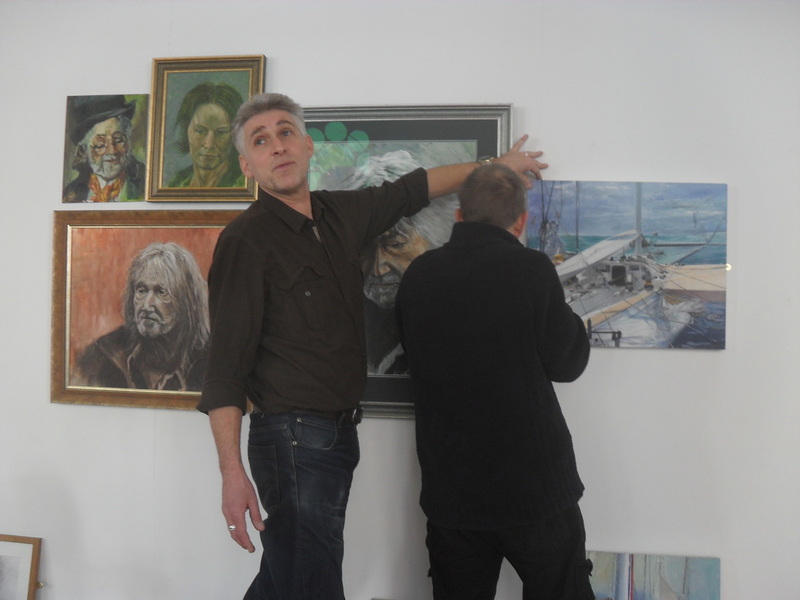 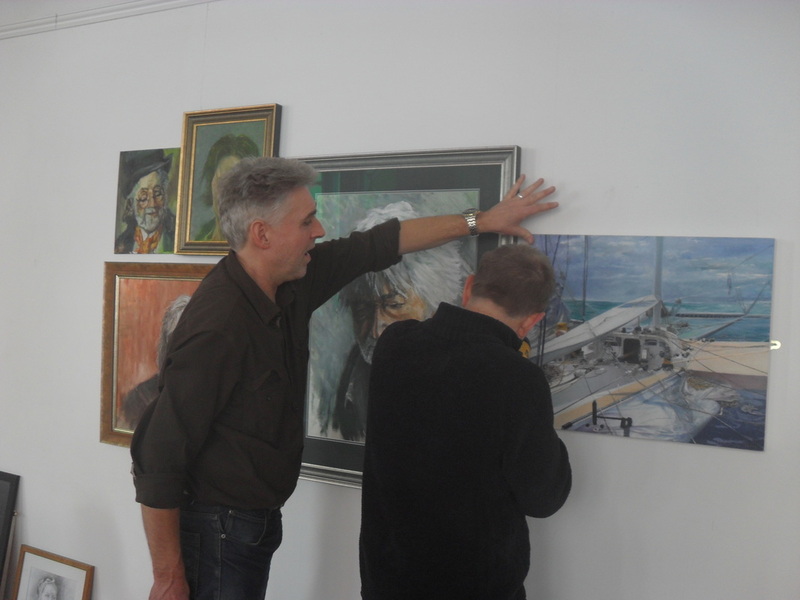 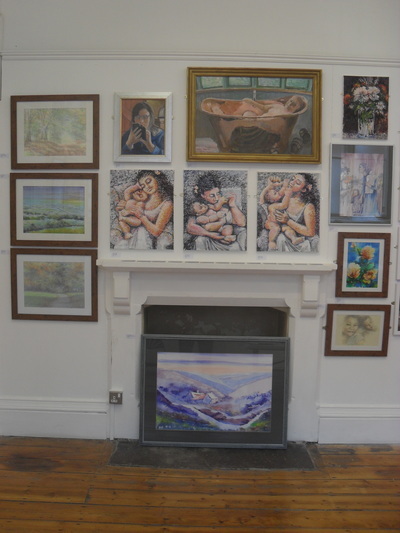 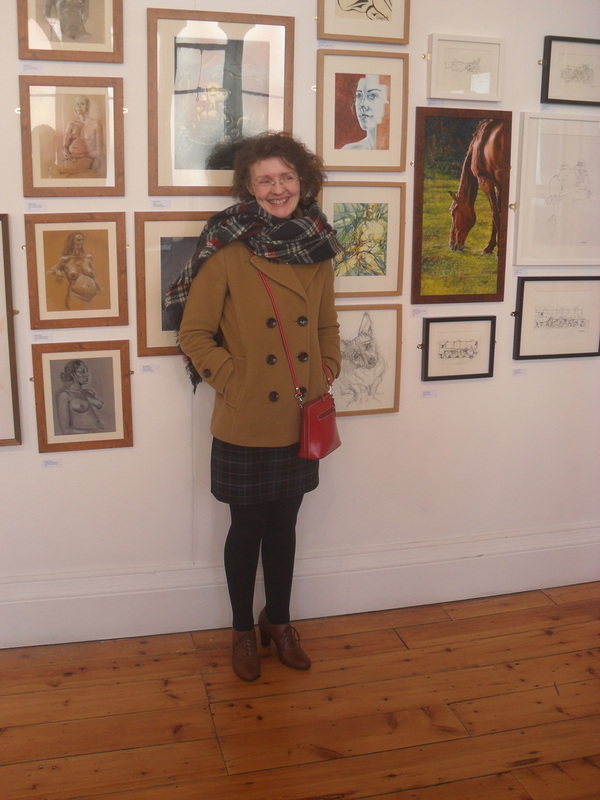 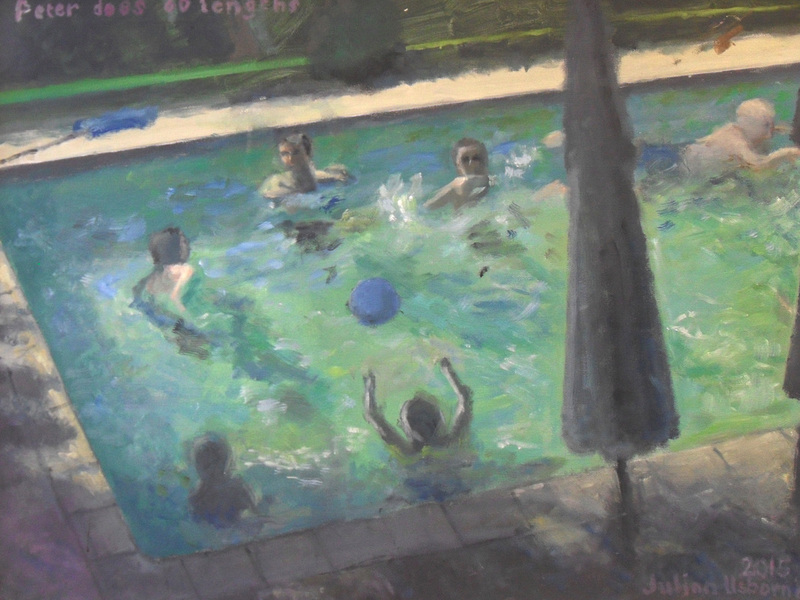 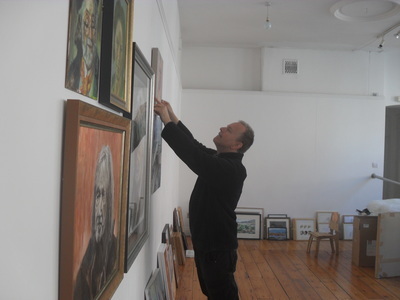 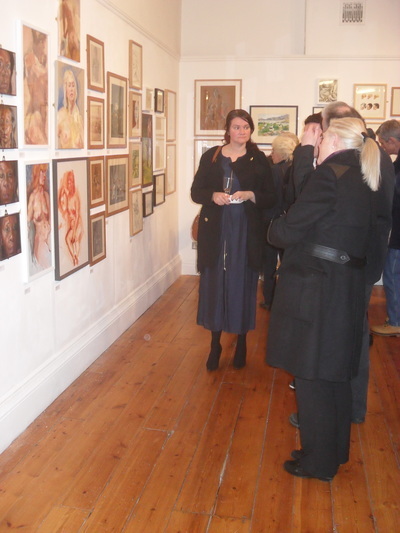 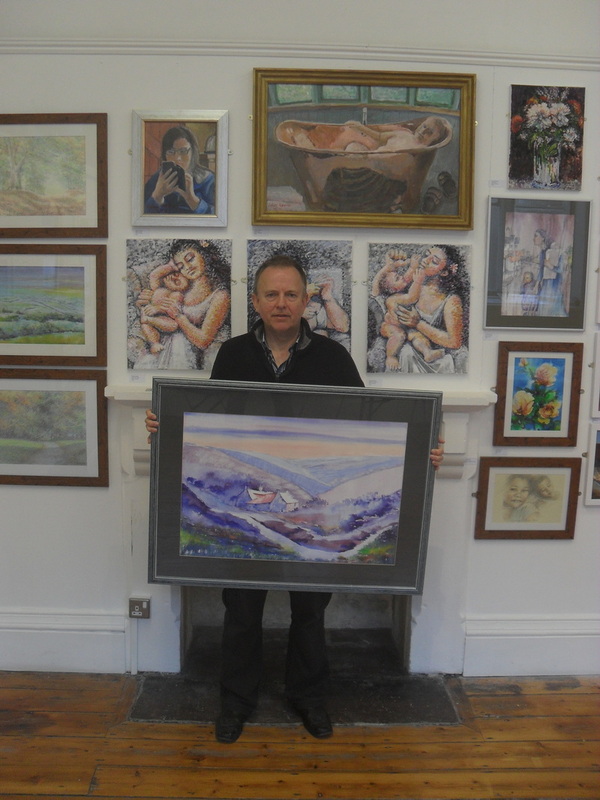 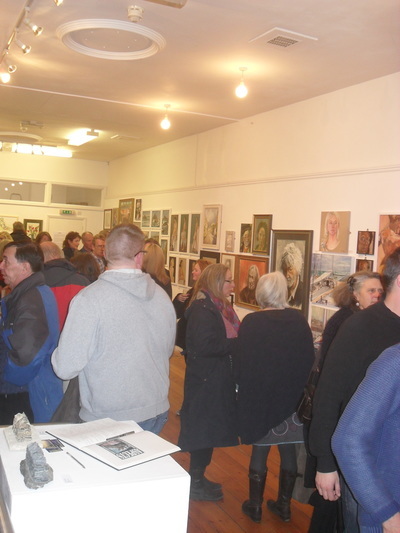 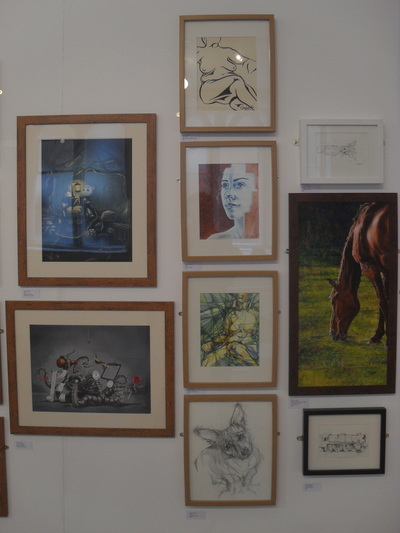 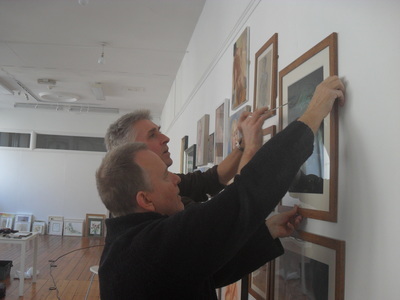 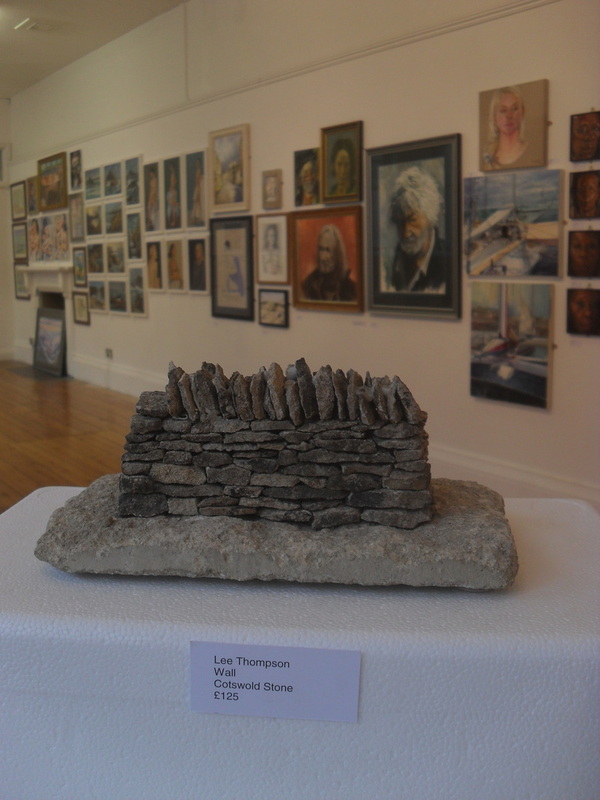 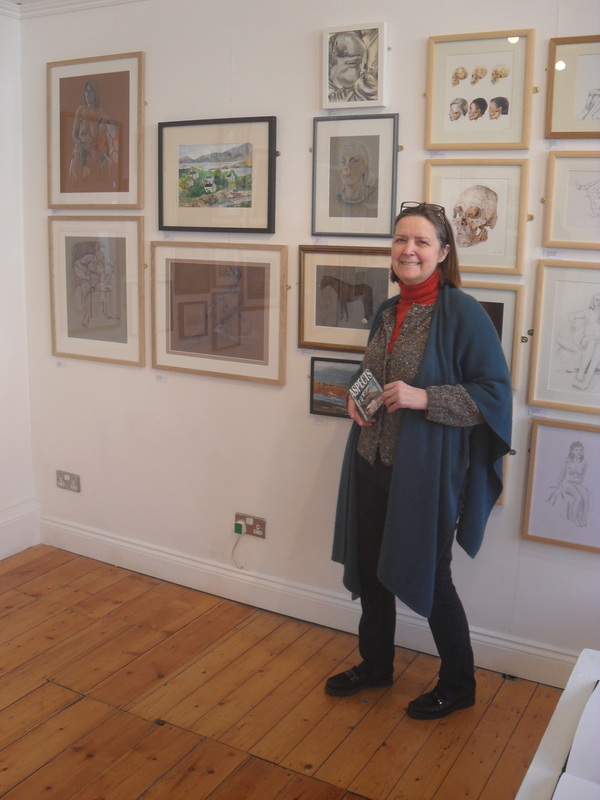 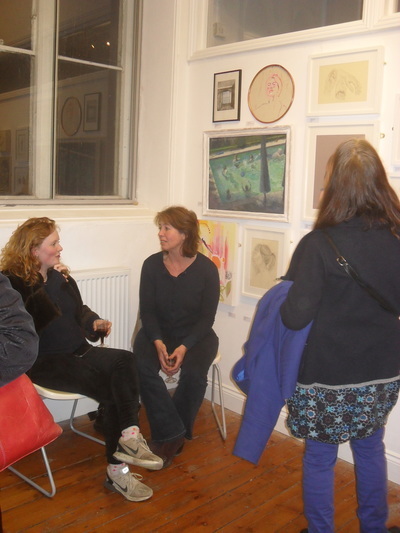 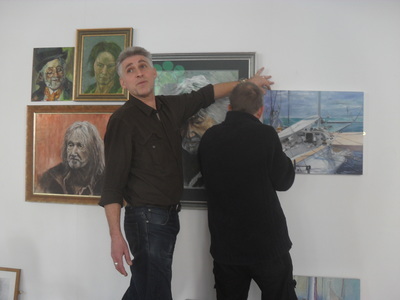 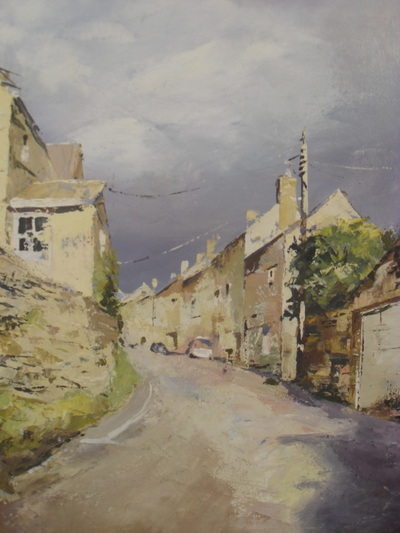 Despite some pleasing sales, it should be stressed that the exhibition was not conceived as a commercial show but as an opportunity for Stroud Life Drawing artists to hang their work on the walls and show what they get up to, both in and beyond the weekly drawing sessions. 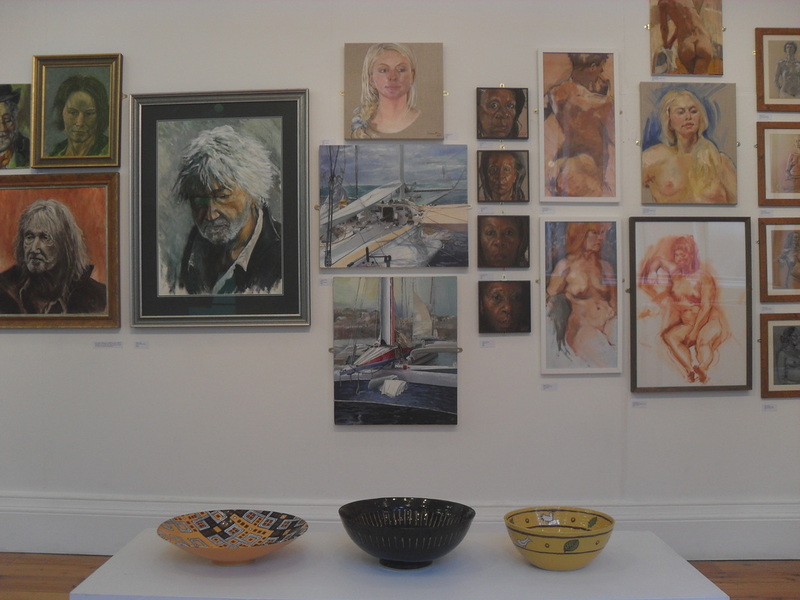 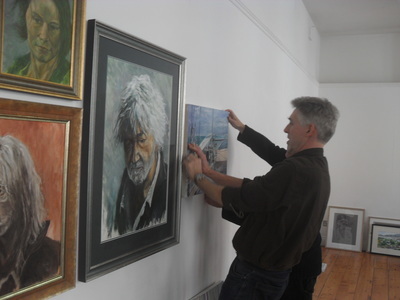 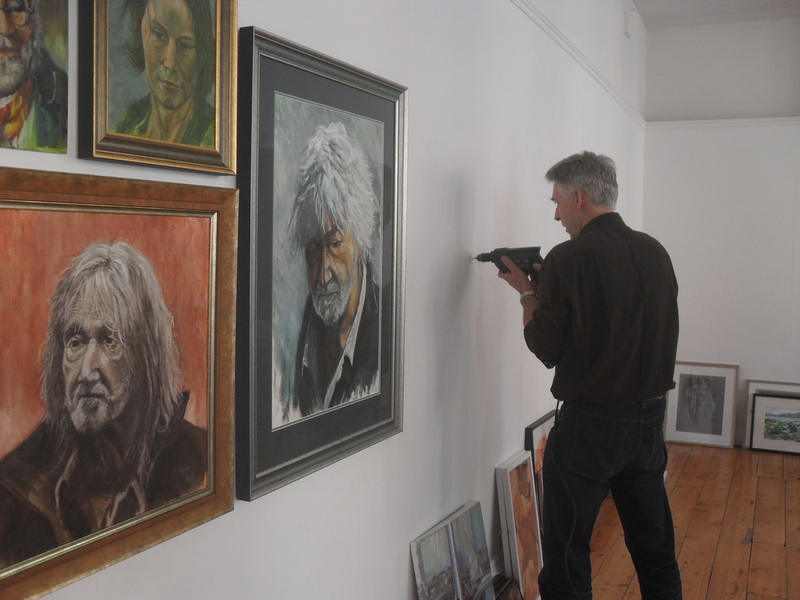 With painting being much in evidence, the gallery was certainly more colourful than in previous years and it was an honour to include three of Julian’s vividly life-affirming oil paintings in the show. 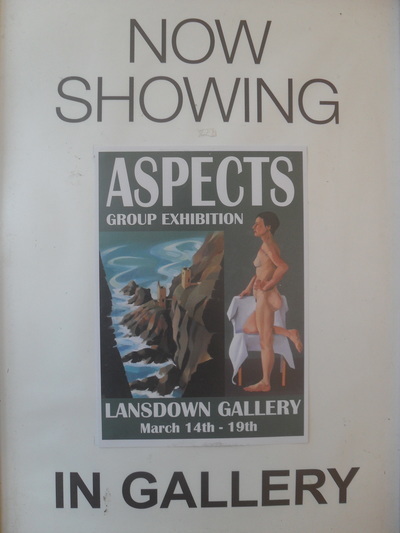 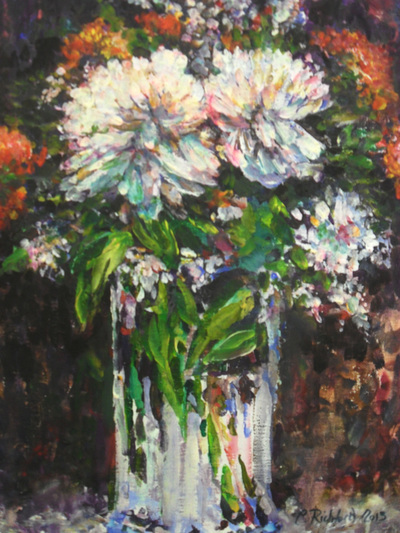 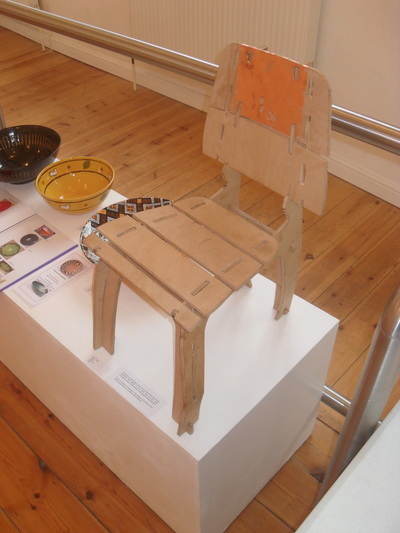 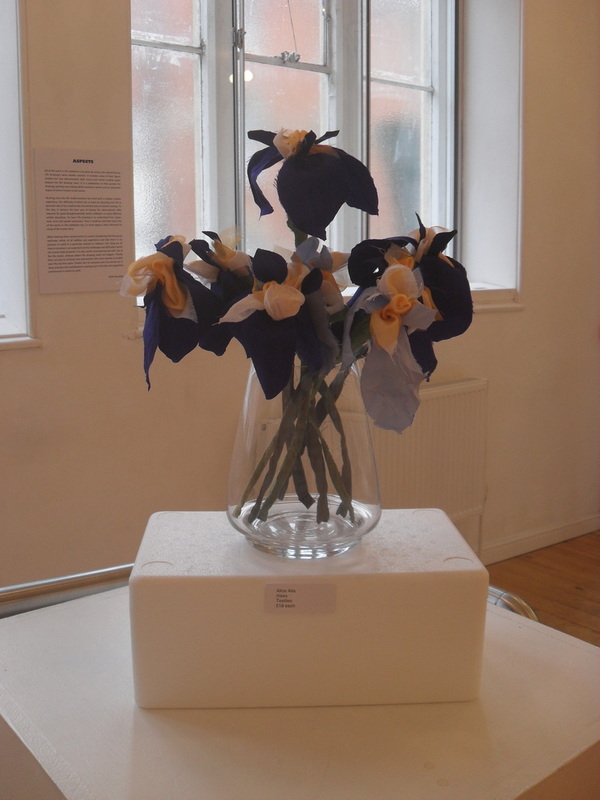 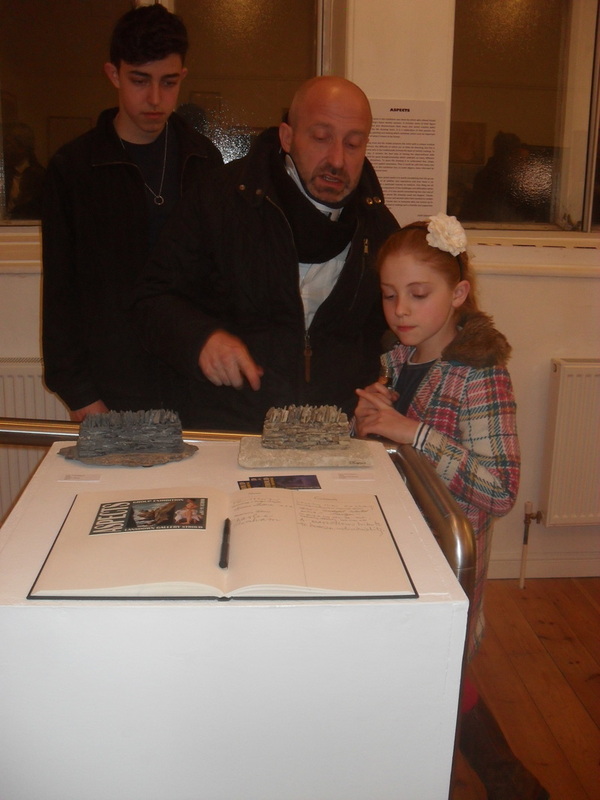 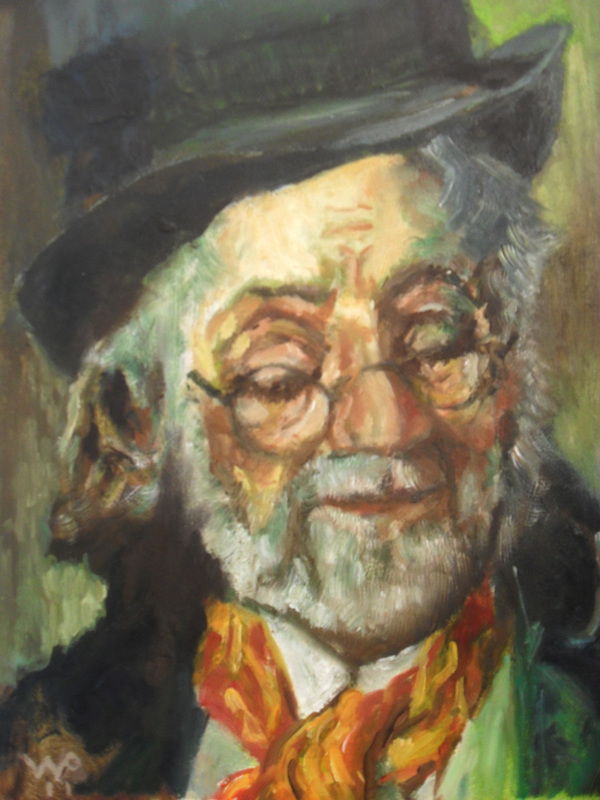 Sadly, he died peacefully at home whist the exhibition was on and I would like to dedicate ‘Aspects’ to his memory; he will be much missed at the Saturday afternoon sessions. 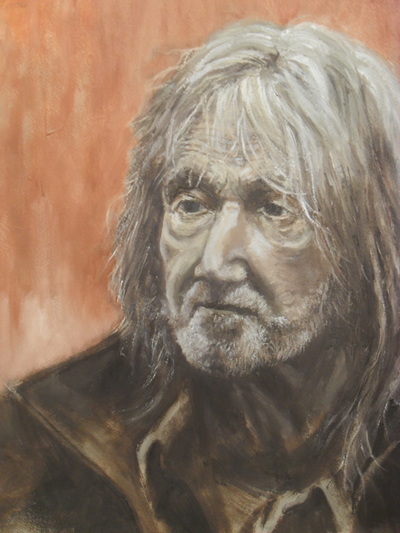 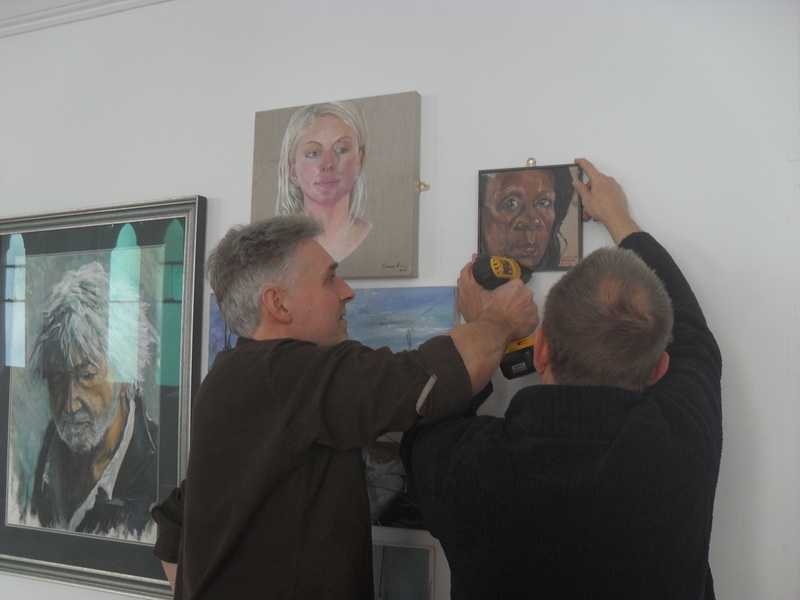 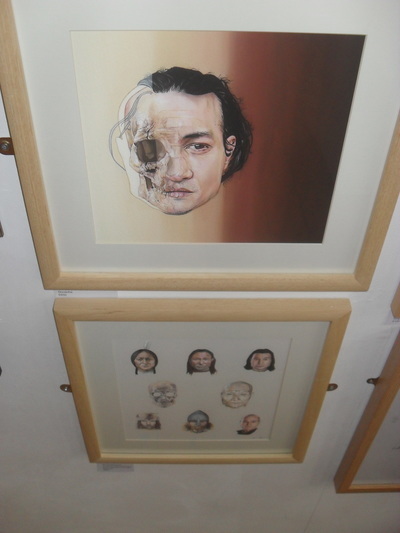 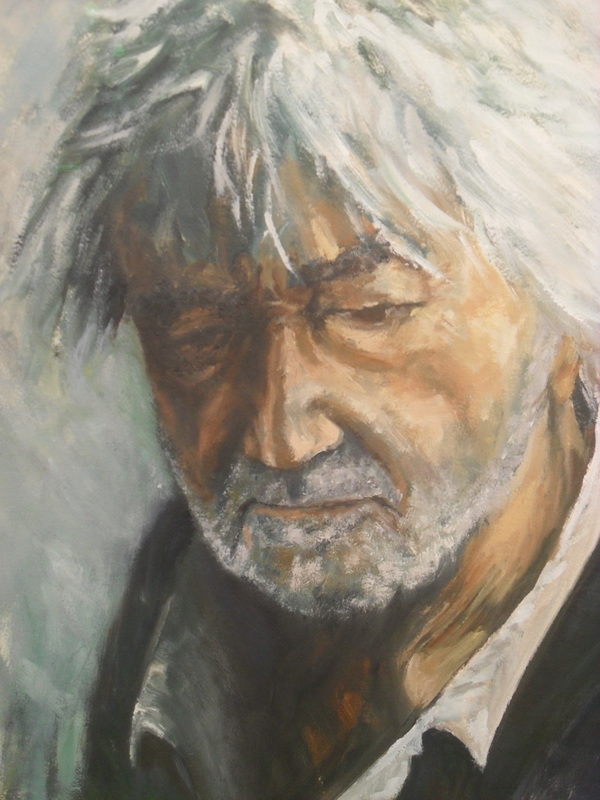 Portraiture was also well represented, with fine examples submitted by Rebecca, Jane, Chris and Liney. Special thanks are due to Dave, who went to some trouble and expense to frame his large and wonderfully painted portraits of the artist Ken Paine. 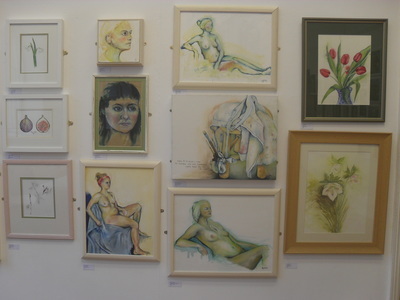 Centrally positioned on the back wall, these leant a real wow factor as one entered the room. 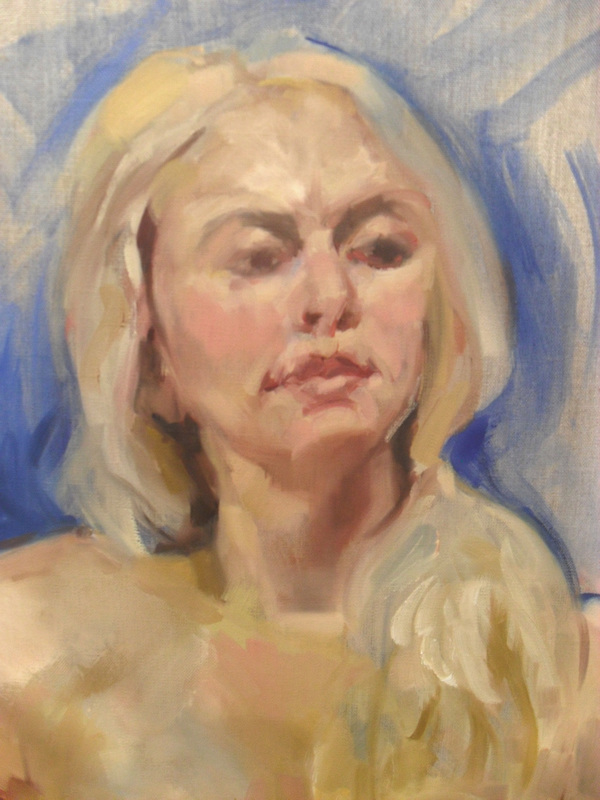 Chasing a likeness in drawing or painting is an exacting and rewarding aspect of life drawing which is all too easily avoided, so credit to everyone who tackles it face on at our regular drawing sessions. 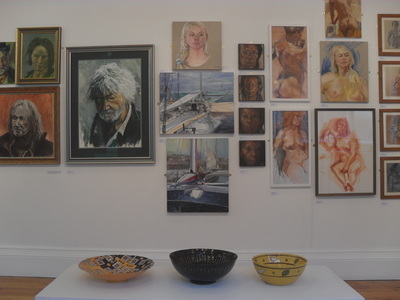 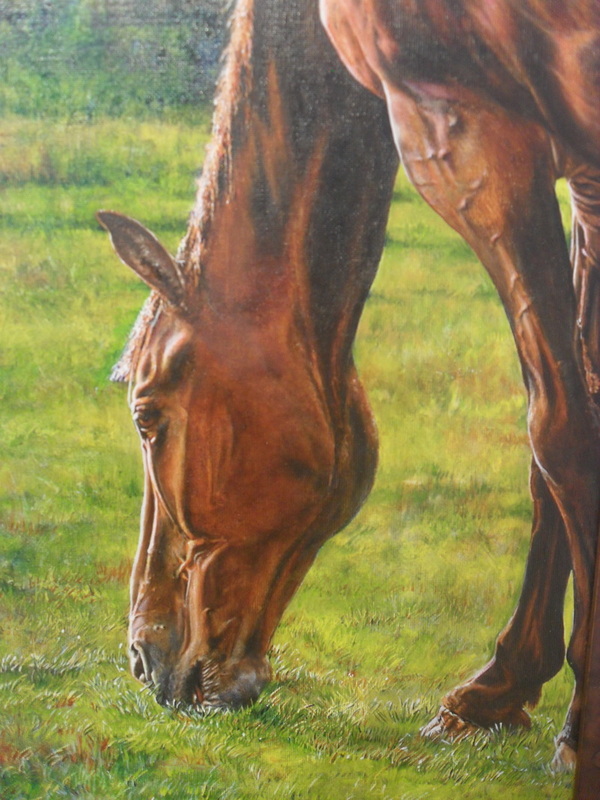 Underpinning everything in the show is the discipline of observing the figure and enjoying the challenge which the human form represents in abundance. 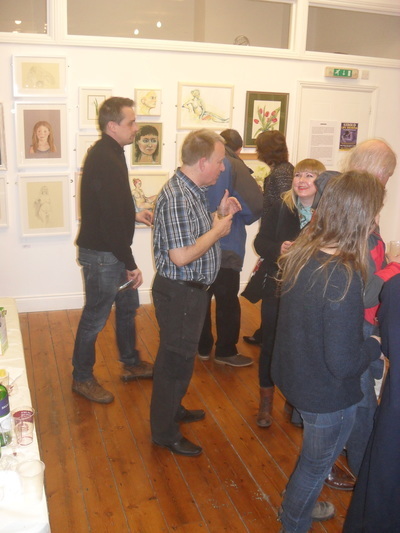 There were too many fine figure studies on show to mention them all but Richard’s group of paintings and Liney’s assured studies in conte ́ pencil were very highly regarded. Thank you to everyone who put work into the show. Many thanks also to all of the men and women who have done such a good job modelling over the last year and, without whom, life drawing would not be possible.